Known to be one of the three Tuberculosis hotspots in the country, Daru is definitely an area that needs attentions in preventing and treating this deadly disease. 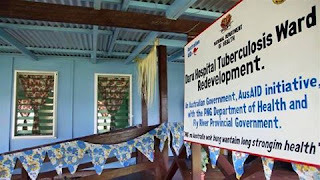 Daru Hospital CEO Sister Orpah Tugo said the annual appropriations for the hospital to carry outs its mandated tasks for 2016 have been exhausted with the efforts of trying to combat TB in the area mostly with active case finding. These included the awareness, use of reagents in TB testing, purchasing of consumables (medicine, gloves etc) and case study to identify the trend and address the epidemic. CEO Tugo said that generally the adult outpatients saw 15,000+ patients but the number has drastically increased to 26,000 people in the 2016 mid-year review (January to June) of the general adult outpatient. She said this drastic increase is attributed to TB in the area and while the hospital is trying its best to cater for all, the annual allocated budget which is under the proposed amount by the hospital cannot cater for its expenditure in the second half of the year. The hospital has debts to repay in from its monthly bills and the CEO said the hospital hopes for a good budget appropriation next year in terms of the proposals by the hospital supported by its active case findings.